Over 20 years ago, Mercy Housing built Casa San Juan and Villa Madera in Oxnard, California for agricultural workers employed by local farms. Raising kids in affordable homes has provided families and kids with dramatically different opportunities than their parents. Angela was nine-years-old when she moved into Casa San Juan with her parents and two brothers. She and her brothers attended the after-school program in Casa San Juan’s community center which provided help with homework and a safe space to play with other kids. When she aged out of the after-school program, Angela enlisted as a volunteer at the same community center. Inspired by the mission of Mercy Housing to serve her community, Angela earned a college degree in social work. She now works for First 5, a nonprofit educational program for underserved children. She lives in a nearby neighborhood with her kids and comes to Casa San Juan almost every day to visit her mom who babysits the grandkids while Angela is at work. When they reach school age, Angela’s children will go to the same after-school program that she attended as a child. Roberta and her husband moved into Villa Madera fourteen years ago with their three young children. From the very beginning, Roberta attended classes at Villa Madera’s community center on parenting, healthy cooking, and money management. When her kids were in elementary school, they participated in Mercy Housing’s after-school and summer programs. Roberta’s two daughters are now away attending college. 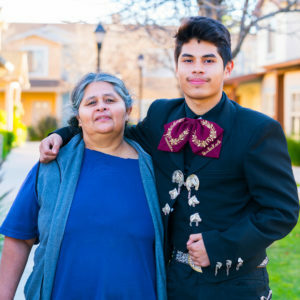 Roberto, the youngest, lives at home and is doing well in high school. Yajaira moved to Casa San Juan three years ago with her family when she was still in high school. Now she attends a local university and is getting a teaching degree. 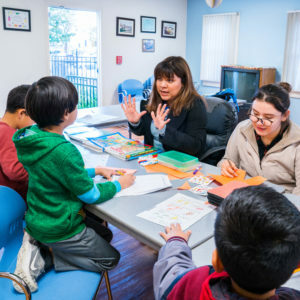 Yajaira works as a tutor at Casa San Juan with a partner organization called Project Understanding, building on established relationships and trust of neighbors. Stories like these are just a few of the many examples of families whose lives were changed by living in Mercy Housing properties.